Some routers have features for handling dynamic DNS. Such is the case of the D-Link DIR-505 router that we will deal with in this tutorial. The Dynamic DNS feature allows you to host a server using a domain name that you have purchased (www.whateveryournameis.com) with your dynamically assigned IP address. Most broadband Internet Service Providers assign dynamic (changing) IP addresses. When you use a Dynamic DNS service provider, your friends can enter your host name to connect to your server, no matter what your IP address is. The most common use of DDNS is remote access to IP, DVRs, NAS, routers, computers, tablets, cameras, smartphones and any device connected to Internet. Some small applications called Automatic Update Client both with DDNS allow us to remotely access devices and files that are connected to the Internet and located in our home, office, etc. Some commercial routers has a module where you can set DDNS parameters, as in the case of D-Link routers, in fact, the same company provides this service. Some companies like www.noip.com or www.dyndns.com provides free DDNS service. D-Link company offer this service only for their customers and the creation of a customer account is needed. This would be our first step to configure our router as a DDNS client. Step 1: create an account on your preferred DDNS service provider, we choose D-Link (https://www.dlinkddns.com). Step 2: Once created the user and password you have to add a host. Maybe your DDNS service provider allows you to create several host for free. 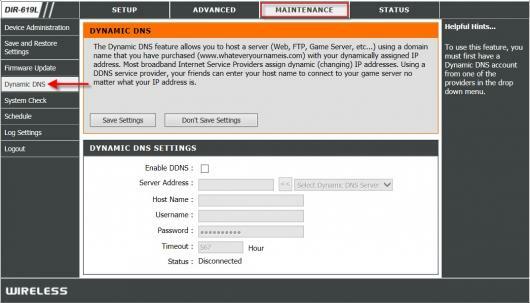 Enable this option only if you have purchased your own domain name and registered with a dynamic DNS service provider. The following parameters are displayed when the option is enabled. Select a dynamic DNS service provider from the pull-down list. Or you may enter a dynamic DNS service provider manually. Enter the username or key provided by your service provider. If the Dynamic DNS provider supplies only a key, enter that key in all three fields. Enter the password or key provided by your service provider. If the Dynamic DNS provider supplies only a key, enter that key in all three fields. Re-type the password or key provided by your service provider. If the Dynamic DNS provider supplies only a key, enter that key in all three fields. The time between periodic updates to the Dynamic DNS, if your dynamic IP address has not changed. The timeout period is entered in hours. Note: After configuring the router for dynamic DNS, you can open a browser and navigate to the URL for your domain (for example http://www.mydomain.info) and the router will attempt to forward the request to port 80 on your LAN. If, however, you do this from a LAN-side computer and there is no virtual server defined for port 80, the router will return the router’s configuration home page.